Wilderness Wanderings slashes through the tangled undergrowth that Christianity in America has become to clear a space for those for whom theology still matters. Writing to a generation of Christians that finds itself at once comfortably ?at home? yet oddly fettered and irrelevant in America, Stanley Hauerwas challenges contemporary Christians to reimagine what it might mean to ?break back into Christianity? in a world that is at best semi-Christian. While the myth that America is a Christian nation has long been debunked, a more urgent constructive task remains; namely, discerning what it may mean for Christians approaching the threshold of the twenty-first century to be courageous in their convictions. Ironically, reclaiming the church's identity and mission may require relinquishing its purported ?gains? ?which often amount to little more than a sense of comfort, the seduction of feeling ?at ease in Zion?? to take up again the risk and adventure of life ?on the way.? Accordingly, this book gives no comfort to the religious right or left, which continues to think Christianity can be made compatible with the sentimentalities of democratic liberalism.Such a re-visioned church will not establish itself through conquest or in a reconstituted Christendom, but rather must develop within its own life the patient, attentive skills of a wayfaring people. At least a church seasoned by a peripatetic life stands a better chance of noticing the changing directions of God's leading. The wilderness, therefore, ought not to appear to contemporary Christians in America as a foreboding and frightening possibility but as an opportunity to rediscover the excitement and spirit, but also the rigorous discipline, of faithful itinerancy. At such a crucial time as this, Hauerwas challenges Christians to eschew the insidious dangers that attend too permanent a habitation in a place called America and to assume instead the holy risks and hazards characteristic of people called out, set apart, and led by God. Wilderness Wanderings is a clarion call for Christians to relinquish the impermanent citizenship of a home that can never be the church's final resting place and confidently take up a course of life the horizons of which are as wide and expansive as the God who promises to lead.The book engages, often quite critically, with major theological and philosophical figures, such as Reinhold Niebuhr, Martha Nussbaum, Jeff Stout, Tristram Engelhardt, Iris Murdoch, John Milbank, and Martin Luther King Jr. These interrogations illumine why theology must reclaim its own politics and ethics. 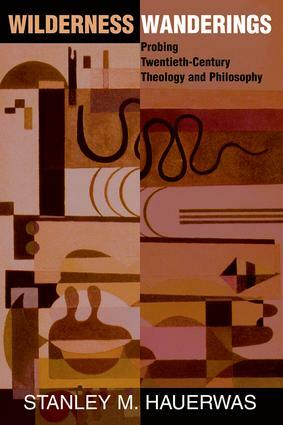 Intent on avoiding abstraction, Hauerwas intervenes in current debates around medicine, the culture wars, and race.